Martha-In-Training: Happy American Thanksgiving Weekend! Thanksgiving weekend in the States comes to an end and I didn't have time to make any turkey. I did buy turkey bacon though and I had it for breakfast this morning so.... problem solved. I'm trying to limit my carbohydrate intake not because I want to lose weight but because I eat so terribly and I find myself turning to quick carb-loaded food items instead of going into the kitchen and making a meal. I'm on day 2 of eating better and already my vegetable intake has been more than it has been in the last few weeks! Thursday night was my last shift in the ICU! It went pretty well, the 12 hours more or less flew by, and the same patient who called me a 'dickhead' on Monday was slightly more sedated. Didn't do too much this weekend, apart from working and then going out last night to hear John's brother play. Oh! I won a give-away! If you aren't already following her and if you like beautiful photography you will like this blog. Lastly, I came across this masterpeice whilst perusing some of the gossip websites. I forget which one but I saw it and I couldn't stop thinking about it. It's on my list of things to do to make a Turducken. This is the desert version. 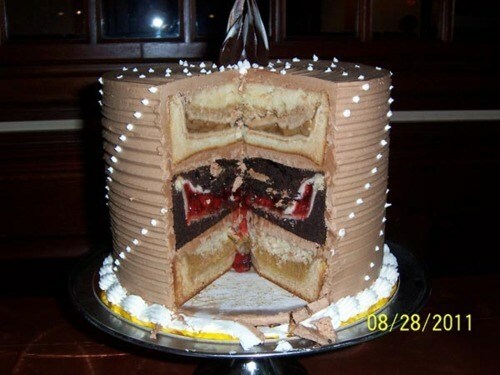 A cherry pie, a pumpkin pie, and an apple pie all baked inside a cake. If I wasn't trying to cut out all junk food I would be in the kitchen right now making this. Congrats on your last shift! You made it and survived! You won't survive if you have even a single bite of the cherpumple. What kind of sick Frankenstein-like genius came up with this concoction? It's like what Jurassic Park taught us about dinosaurs, just because you can do something doesn't mean you should.